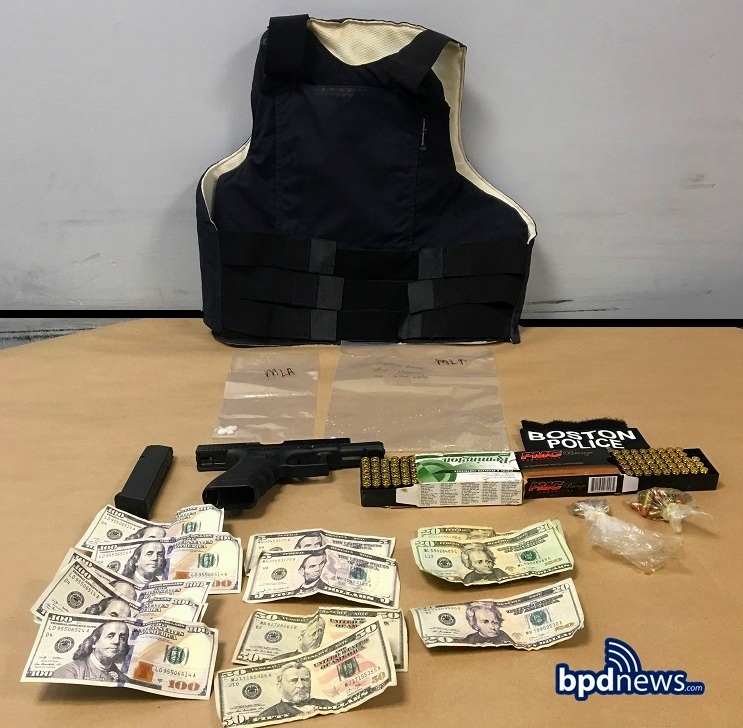 At about 11:16 PM on Friday, March 15, 2019, detectives assigned to District C-11 (Dorchester) executed a search warrant in the area of 472 Washington Street in Dorchester. As a result of the search warrant, officers recovered the following items: a Bryco Jennings 9mm Firearm loaded with eleven rounds of live ammunition, a Colt MK IV Series 70 Firearm loaded with four rounds of live ammunition, six small plastic bags containing a substance believed to be heroin, three small plastic bags containing a substance believed to be Fentanyl, and three small plastic bags containing a substance believed to be crack. Officers arrested Dequell Golson, 26-years-old, of Dorchester. Golson is expected to be arraigned in Dorchester District Court on multiple charges including two counts of Unlawful Possession of a Firearm, Unlawful Possession of Ammunition, Unlawful Possession of a Large Capacity Feeding Device, Improper Storage of a Firearm, Possession with Intent to Distribute Class A Drugs, two counts of Possession with Intent to Distribute Class B Drugs, Possession of Class A Drugs, and two counts of Possession of Class B Drugs. 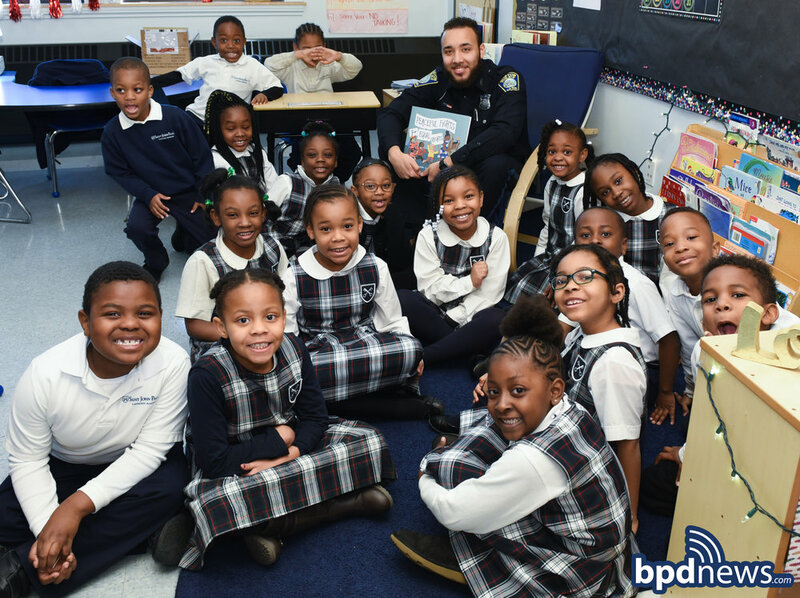 BPD IN THE COMMUNITY: On Monday, January 28, 2019, members of the Boston Police Department including Superintendent Baston, Deputy Dahill, and Deputy Chin, spent time reading books to the students of Saint John Paul II Catholic Academy in Lower Mills. The officers had a blast hanging out with the kids while sharing some of their favorite books! The Boston Police Department would also like to extend a special thank you to the staff at St. John Paul II's for their invitation! 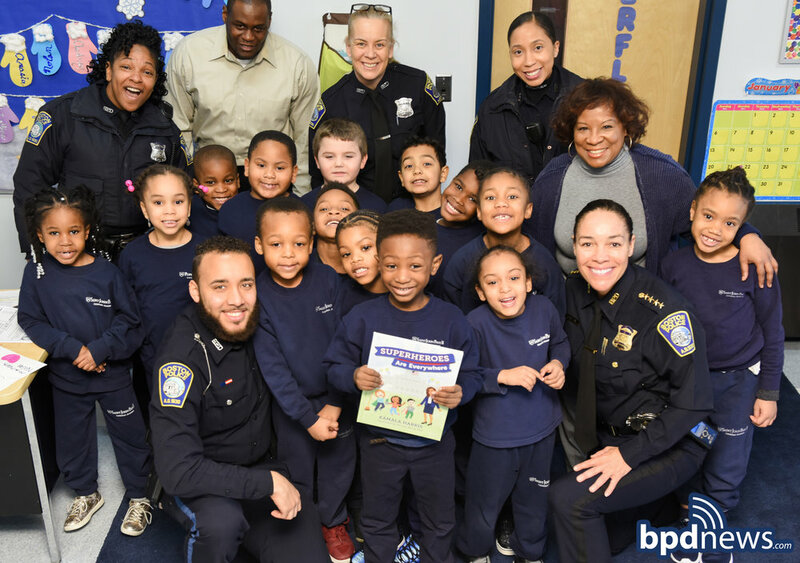 Last week the Boston Police Department, along with the Boston Bruins, and the Boston Athletic League discussed fitness and anti-bullying prevention at St. Brendan’s School in Dorchester. The kids were excited to see Blades, the Bruins Mascot; who gave them hi-fives and hugs. A few members from the Massachusetts State Police were present to support the program and talked about the importance of partnership and friendship. Fun was had by all. ONE LESS GUN: At about 7:00 AM on Thursday January 10, 2019, officers assigned to District B-2 (Roxbury) executed a search warrant with the assistance of the Boston Police SWAT Team in the area of 6 Brook Avenue in Dorchester. 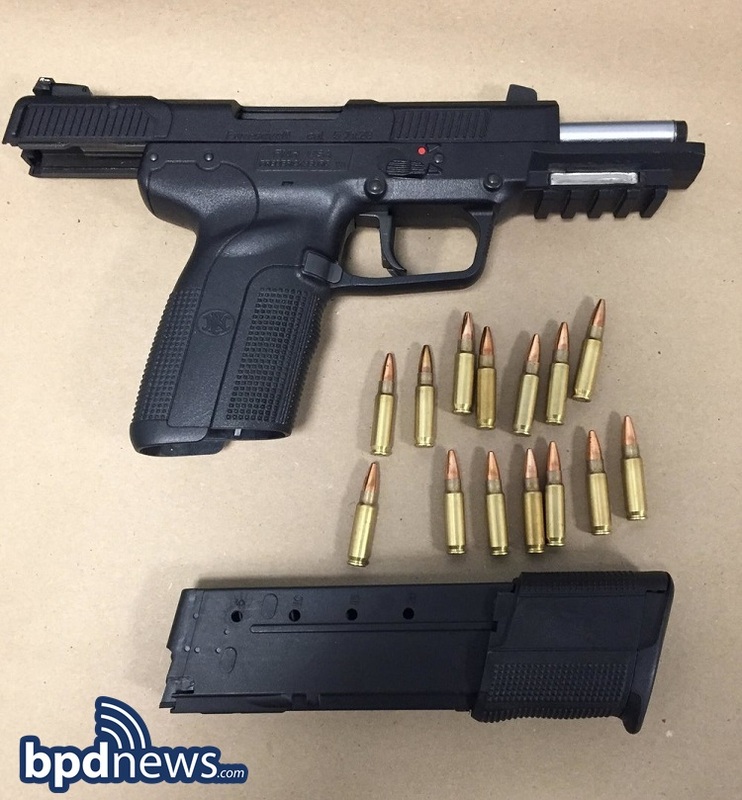 Officers were able to recover a loaded .380 caliber Colt handgun while arresting the target of their investigation, Luis Pina-Baptista, 44, of Dorchester. The warrant was sought in connection to an incident that occurred at about 10:40 PM on Thursday January 3, 2019, in the area of Upham Avenue in Dorchester during which an adult female victim was confronted by the suspect who was later identified by investigators. During the confrontation, the suspect pointed a handgun at the victim during an apparent ‘road rage’ incident. UPDATE: Initially believed to be stolen from the area of 273 Columbia Road in Dorchester, Lola the dog has been reunited with her owner. No charges are expected to be filed in regards to this incident. The BPD would like to thank all community members who have assisted in this investigation. Daily Dose of Great Police Work: At about 12:57 AM on Saturday December 29, 2018, officers assigned to District C-11 (Dorchester) arrested four suspects after responding to a call for an armed robbery in the area of 14 Trull Street in Dorchester. On arrival, officers located an adult male victim who stated that he had been robbed by four individuals, two armed with knives, who took his cellphone and tablet before fleeing the area in a vehicle. Additional responding officers soon located and stopped a vehicle matching the given description in the area of Adams Street and Winter Street. As the suspect vehicle was slowing to a stop, officers observed the front passenger side door open slightly as an object was discarded on the ground. The item was later recovered and determined to be the victim’s tablet. Officers removed all four occupants from the vehicle and placed them in custody without incident after they were positively identified. Victor Torres, 41, of Dorchester, Angel Torres, 36, of Mattapan, John Santa, 29, of Dorchester and Sandro Rosa, 31, of Boston, will be charged with Armed Robbery in Dorchester District Court. At about 11:27 PM on Wednesday on August 1, 2018, officers assigned to District C-11 (Dorchester) responded to a call for a person down in the area of 26 Torrey Street in Dorchester. On arrival, officers located a male victim laying on the ground behind the address suffering from a head injury. The victim was pronounced deceased on scene. This week, the Medical Examiner’s Office ruled victim’s cause of death to be a gunshot wound and his manner of death to be homicide. The victim has since been identified as Trevis Catron, 23, of Dorchester. BPD Remembers The Service And Sacrifice Of Officer Frederick W. Bartlett Killed In The Line Of Duty On This Day 88 Years Ago: The men and women of the Boston Police Department remember the service and sacrifice of Officer Frederick W. Bartlett who was killed in the line of duty on this very day 88 years ago. On December 9, 1930, Officer Bartlett was injured when he was struck by a motor vehicle while directing traffic at the scene of a fire in the area of Gallivan Boulevard and Washington Street in Dorchester. Officer Bartlett later succumbed to his injuries on December 10, 1930. Bartlett, who was an 11-year veteran of the department, was 42-years-old at the time of his death. Making his passing ever more tragic is the fact that he left behind a grieving wife and one child. Officer Bartlett was laid to rest at St. Joseph’s Cemetery in West Roxbury and his name is located on the National Law Enforcement Memorial, Panel 62, West Line 12. In Boston, a Hero Sign (see photo) is posted to honor his life and service in the area of Gallivan Boulevard and Washington Street in Dorchester. If you’re passing through the area, please keep an eye out for his Hero Sign and kindly take a moment, not only to honor his sacrifice, but to remember the loved ones left in mourning after his tragic passing so many years ago. #BPDinTheCommunity: In keeping with their ongoing commitment to promote physical fitness, healthy living and nutrition, representatives of the Boston Bruins with help from Boston’s Finest stopped by Girls & Boys Club of Dorchester to spread the good word and virtues of health, wellness and exercise to the kids at the club. After a lengthy discussion about the importance of healthy eating, our officers and the kids squared off in a high scoring, fun-filled game of street hockey. Special thanks to the Bruins and Boston Police Foundation for sponsoring this wonderful community event. Additionally, the Girls & Boys Club received a generous donation of a full and complete set of Franklin Sports Street Hockey equipment that will help the kids grow and develop both their hockey skills and love of the game. 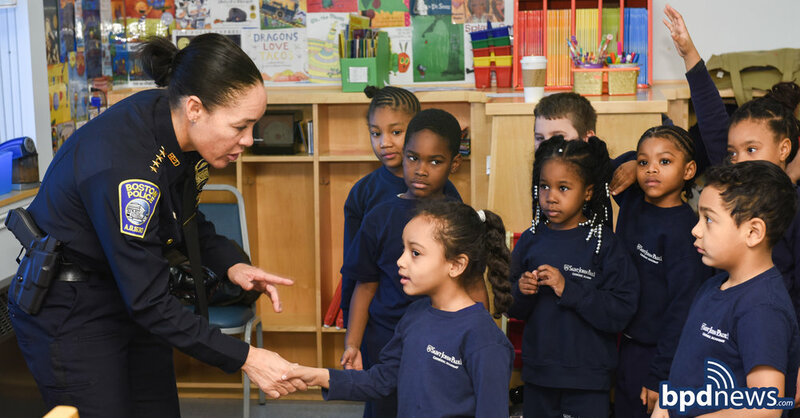 BPD Photo of the Day: It’s always nice to see our officers making positive connections with young people in the neighborhoods we serve. Some connections and relationships take time to build while others are much more immediate. Last night, at the Mayor’s Tree Lighting Ceremony in Lower Mills, Officer Leroy Fernandes was busy making happy memories for a couple of young Saint John Paul Academy students on his very first day on duty at his new assignment in District C-11. The boys loved their time trying on a traditional eight-point hat, holding a real police radio and playing inside the cruiser. Nice job by Officer Fernandes demonstrating community policing in action. #BPDinTheCommunity: BPD Deputy Superintendent Felipe Colon had a delightful time giving thanks, sharing stories and enjoying the company of some of our more treasured community members at the Thanksgiving Luncheon for Seniors at the Unity Sports & Cultural Association in Dorchester earlier today, Sunday, November 18, 2018. Thanks to everybody who made this event the special occasion that it was.